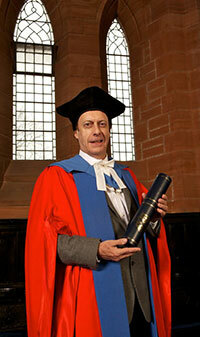 Strathclyde have given an honorary degree to a 12-time technical Oscar winner. Professor Iain Neil, who was given the degree this month, is the most prolific living technical Oscar winner, and second only to Walt Disney in the Academy Awards’ history. A pioneer in optical design used in cinematography, Professor Neil graduated in Applied Physics from Strathclyde in 1977. He has also won 2 American Emmys and has over a hundred patents worldwide for his designs. Previous recipients of honorary degrees include writers Seamus Heaney and Andrew O’Hagan, and athlete Oscar Pistorius, who had his stripped earlier this year. Professor Neil is a winner of the Fuji Gold Medal from the Society of Motion Picture & Television Engineers and was named Strathclyde’s Alumnus of the Year in 2003. He is a fellow of the International Society for Optics and Photonics and a member of the Academy of Motion Picture, Arts & Sciences. Posted in News and tagged honorary degree, Iain Neil, news, oscar winner, strathclyde. Bookmark the permalink.